Mikado The Emperor dei Leoni Imperiali for Kimekai (Imp. Italy) "Mikado"
This new journey began in 2017 when I attended the Chow Chow Show in Italy. A trip undertaken to meet the dogs and breeders of bloodlines that I admired and had identified to help me craft my future vision for Kimekai. Eighteen months later, I received word that a litter of puppies from my dream bloodline was born. In November 2018 Massi, Tiziana and all at Leoni Imperiali were gracious in opening their home to me and I spent time with this exceptional litter of puppies. I was also privileged to be invited by Stefania and Saverio to meet the litter Sire, Sonny and Grandsire, Mirty. Choosing my pup was no easy task as the boys were of equal excellent quality. On the day I left Italy, a forward and confident puppy looked me in the eye with an expression that undeniably conveyed “ I will be the Lion of Africa ” and I knew then that I had found a puppy that would follow in the huge pawprints left behind by my beloved Kendo. His birthdate made his travel to South Africa difficult and finally in February after an endless journey of thousands of kilometers in planes, trains and automobiles, Mikado The Emperor joined Ki-Mi and Kasumi at Kimekai (South Africa). 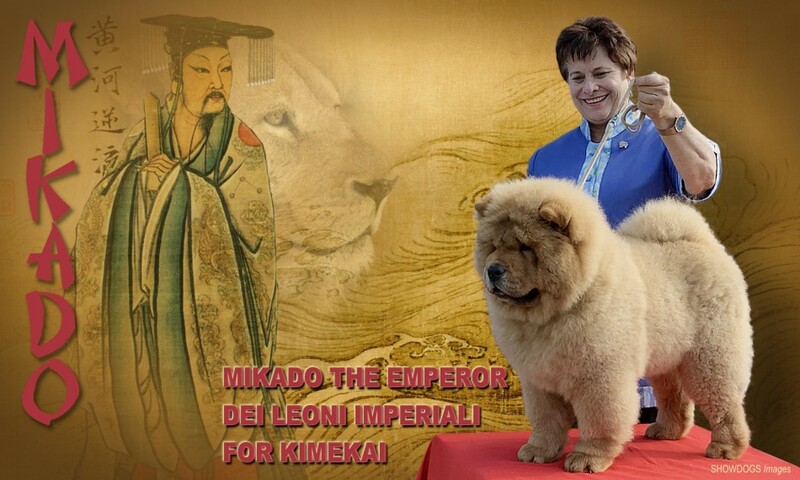 Within weeks of his arrival, Mikado, a Chow Chow with uncurtailed curiousity and superbly correct conformation, debuted in Southern Africa by winning back to back BBPIS at his first two open shows, followed by back to back BBPIGs and a RBBPIS at his first championship shows. Mikado's successful debut is not surprising as he comes from a strong, healthy line of top achievers. The most recent of which was at Crufts (2019) when his Sire was awarded the RCC to his Grandsire who was awarded the CC, his 3rd Crufts Best of Breed and his 3rd Crufts group shortlisting! His Grandsire thus making history within the Chow Chow circles at Crufts for his breeder and owners. Continuing in the bright light left by Kendo and the successes of his ancestry, Mikado holds his own flame high and is ready to step onto the shoulders of giants with ease. We look forward to Mikado's adventures, with grateful thanks to Leoni Imperiali.